(CNN) - The Senate voted unanimously on Monday to renew a 10-year ban on guns that cannot be picked up by metal detectors commonly found in airports, court houses and government buildings. The law, which prohibits firearms made mostly of plastic, was set to expire at day's end. It had drawn renewed attention recently due to its pending expiration and the advent of mainly non-metalic handguns produced by 3-D printers. The House acted last week, and now the measure goes to President Barack Obama for his signature. A White House official said the President is expected to sign the legislation. But the Obama administration and congressional Democrats had been pushing for an extension to also deal with potential loopholes for 3-D-printer guns, which the congressional legislation does not do. 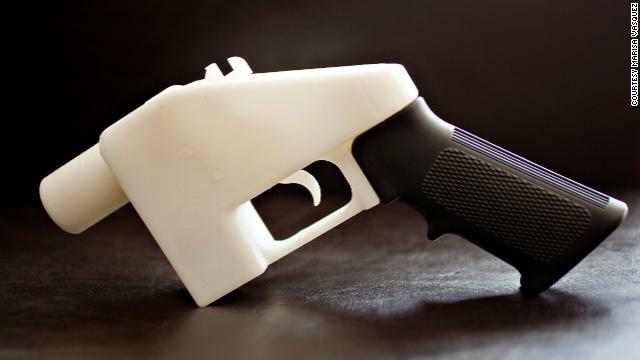 Currently, plastic guns made using 3-D printers comply with the law by inserting a removable metal block. That has led to worries plastic guns could pass through metal detectors without being flagged by simply removing the block. Prior to Senate renewal of the legislation, the chamber rejected a proposal by New York Democrat Charles Schumer that would have required any plastic gun to include a substantial metal part that can't be easily removed. conceding defeat to his own gun control agenda, the President signs the Republican bill. Excellent. So, who wants to bet that now that they extended the law banning undetectable guns, they don't bother allocating any money to work on ways to detect said guns? What a waste of time. All of the practical "plastic" guns still contain many metal parts. You just can't make a plastic barrel or firing pin that will last for more than a shot or two. On top of that, the ammo is still made of metal so what good is a gun you can sneak through a metal detector with no ammo? Gov needs to get all guns from people so it can continue to do it's good work. Oh good. The NRA has successfully protected the profits of the gun industry while treading all over the Second Amendment. It's good to see cases like these that expose what the NRA *really* cares about. I think it would be a better idea to just ban rounds made out of plastic, i.e., force rounds or their casings to be made of metal. It's not like you can shoot an empty gun anyway. This sounds like a slippery slope to gun confiscation. The next step will be Obama issuing an executive order that all guns should be banned and taken away. Next he will appoint himself president for life of the new combined country of the United States and Kenya. Ban Plastic! Do it for the children. Unless someone has invented plastic ammunition to go along with a plastic gun I don't see how it would avoid detection in a metal detector. I'm also pretty sure a terrorist wouldn't abort his plans to hijack a plane with a plastic gun because Chuck Schumer and Obama say they're illegal. I'm surprised the Republicans let this one get through. They typically consider the Second Amendment (and no other Amendment) as sacred as the Bible and don't even consider anything that even mildly inconveniences gun owners. Gun control that actually has hope. Schumer's proposal should have been included. In this instance, our dysfunctional congress was torn between the interests of our national security, and what exactly? Who opposed the new law ? I really like the subconscious dig at AR15s in the picture. We get an article about how bad these guns are and they show a picture with an AR15 grip attached to the newest bad gun. Shows how little Chucky knows about firearms. A firearm must be easy to disassemble for proper maintenance and safe operation. Useless legislation. Let's ban non-detectible explosives too.